Reinert’s main argument is that the wealth of a nation is based upon the economic activities it specialises in. Poor countries are poor because they specialise in agriculture and the production of raw materials. This is an economic dead end as it does not allow for increases in productivity or innovation, which is how countries get rich. On the other hand, rich countries got rich by industrialising and building up a manufacturing base. 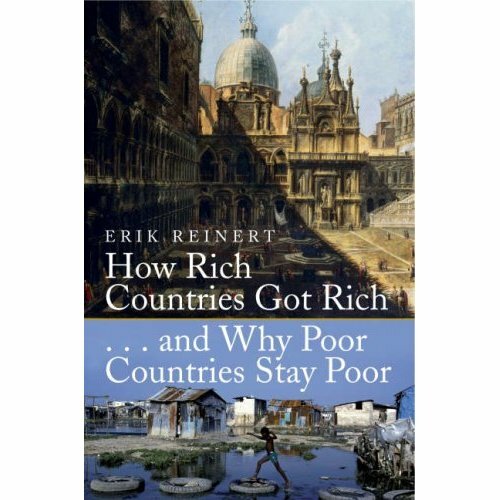 Reinert denounces Ricardo’s theory of comparative advantage, because it means some countries specialise in being poor. In his view Ricardo’s theory offers a moral justification for colonialism. It offers economic reasons why some countries should be left undeveloped. He criticises the theory for failing to differentiate between economic activities and assuming all activities have constant returns to scale. This is a crucial flaw. In contrast to the theory of comparative advantage, Reinert offers the theory of emulation. This is where countries try to copy, replicate or emulate successful countries. For example after gaining independence, America did not specialise in agriculture (as Adam Smith advised), rather it industrialised. It used subsidies and tariffs to build what would become the most successful manufacturing base in the world. Third World countries are poor because they specialise in the production of raw materials which suffer from diminishing returns to scale. This means that each additional person employed produces less than the person before them produced. This means that specialisation would actually make a country poorer rather than richer. It should be noted that they specialise in areas that are devoid of potential for innovation and new ideas. Also, what little innovations or productivity increases there are in raw materials tend to result in lower prices for the same goods. This means it is the consumers of the rich countries who benefit. In contrast, First World countries specialised in manufacturing which has increasing returns. Because fixed costs are so high, each additional person employed makes the final product cheaper and more profitable. As manufacturing benefits hugely from economies of scale, countries that specialise in it grow rich. There is also wide space for innovation and productivity increases which are absent from agriculture. Innovation in manufacturing leads to new products which create higher profits, wages and government revenue. Reinert criticises neo-classical economics for having forgotten how First World countries got rich in the first place. They did not get rich by minimising the role of the state and implementing free trade. Rather it was through heavy state intervention in the form of subsides and tariffs. For example, in 1485 King Henry VII launched a deliberate policy of state intervention that made England a rich country. At the time England was an exporter of raw wool, an activity that was not particularly profitable. He encouraged the development of a manufacturing sector by granting tax exemptions and temporary monopolies to cloth manufacturers. He imposed export duties on raw wool to encourage keeping the raw material in the country. The result was a strong and developed industrial sector. England grew rich on the basis all subsequent nations have become rich on, importing raw materials and exporting industrial goods. These policies have also been followed by America, South Korea, Japan and others. Whereas Russia followed the neo-classical model of free trade and no state intervention with disastrous results. What is just as important is what happened next. After developing an industrial base behind a protective wall, English industry was ready to compete. Once England was developed, it no longer needed protection. The need for a larger market to gain larger economies of scale lead to the development of free trade during the 19th century. This is a crucial point that is often over looked. Free trade does benefit a country but only if it is developed enough. Free trade as it is practices now, often leads to the removal of barriers before local industries are ready to compete, which leads to their destruction. This means it is not a question of whether free trade or protectionism is a better policy; it is which suits a country at this moment in time. The strongest argument in Reinert’s favour is that the policy actually works. While Ricardo’s theory is an abstract theory, emulation is a theory that has repeatedly worked in practice. Reinert notes that no country has ever gotten rich through agriculture; instead they got rich by having a strong and prosperous industrial sector built up by active government policies. Ireland is interestingly used as an example. We were essentially treated like a colony under English rule, in that we were prevented from having an industrial base and instead forced to specialise in agriculture. The results are plain to see. Production of cheap food allowed England to focus on industrialising but meant Ireland was kept in poverty. Reinert shows that rather than staying as producers of raw materials like Ricardo would suggest and Third World countries are forced to, Ireland choose the strategy of emulation. We replicated the policies of the richest countries and developed an information technology sector that is now a world leader. This brought prosperity that specialisation in raw materials and agriculture never could. Reinert discusses the division in types of manufacturing carried out by rich and poor countries. Rich countries focus on areas that are at the edge of new knowledge and are capital intensive. This focus on innovation and research is essentially a barrier to entry giving companies an advantage over their rivals. This, along with the fact that labour costs are only a small fraction of total costs, means that these firms can pay higher wages and still have high profits. Poor countries instead focus on the manufacturing that is labour intensive and not knowledge based. This pays low wages and is a technological dead end. To sum up, rich countries got rich by building up a manufacturing industry that allowed them to benefit from economies of scale and increasing returns. This was built by active state intervention using a combination of subsidies and tariffs. They were at the forefront of innovative new technologies. Poor countries on the other hand are stuck in the dead end production of raw materials which suffers from decreasing margins of returns and little room for innovation. In other words to become rich, a nation must ignore neo-classical free marketers and instead follow the proven method of infant industry protection. I found this to be very enlightening on the history of these countries’ economics. I can appreciate your review. Excellent. Thank you Robert for a thought post. I have not read this book, so I cannot opine on its contents. But I have a strong reaction to one of the things you mentioned here that caused me to go look at the publication date. What I have observed is a decline in all but a handful of industrial economies (and even a decline in the growth of those exceptions e.g. China). The emerging winners in the current world seem to be the resource economies. Even within the US, the States with the lowest unemployment are the underpopulated resource rich States (like North Dakota and Wyoming) while the States with lowest job growth are the overpopulated but resource poor States like Florida and Nevada. To me, it looks like the role of industrialization as the main driver of economic outcomes may become increasingly informed by a simple matter of how many resources are shared among how many people. Found this randomly after you thumbs upped on my posts. Very thoughtful and helpful. I have some questions. Do you have an example? Why is this so? Doesn’t mining and farming get more productive over time. Please help me with this one. 2. Related. You write “Third World countries are poor because they specialise in the production of raw materials which suffer from diminishing returns to scale.” Is this the same claim as in (1) or just related? Well that is the main argument of the book. Basically it comes down to the low-hanging-fruit principle which is that the most fertile fields are ploughed first, then if there is extra demand extra less fertile fields are ploughed. While there is some space for innovation and productivity increases in agriculture it is extremely limited and is nowhere near those in manufacturing. For example agriculture productivity hasn’t advanced much since the introduction of tractors. Points one and two are pretty much the same. An example is given in the book of Peru in the 1970s. Disease had struck bananas in rivaling countries so Peru sought to take advantage by doubling its production of bananas. To do this jungle land was cleared. However it was far less productive and the ratio of production per acre halved. I’ve just discovered your blog, after you “liked” on of my posts. I’m delighted to meet another free thinker, and I’ve been perusing your old posts. Let me throw a wrench into the farming side of this. I believe, based on your description of the book (I haven’t read it), that the author is referring to the modern, mono-culture method of agriculture. In this method, a field is worked literally to death, to the point that not even large doses of chemical fertilizers can revive it, certainly not to the point where it can compete in a competitive market. The land is then sold to developers who sterilize it further, and build on it. If farming is done in ways that replenish the soil, and allow it to rest periodically, people can survive, and even flourish, provided population is kept in reasonable check, and provision is made for droughts and other disasters. True, they aren’t as rich as the rich countries, but neither are they poor. This method places the home and family as the central economic unit, as they build, grow, and trade/sell for their needs. I submit that “poor countries” were not poor until conquerors arrived and destroyed their way of life, and thus, their sustenance. The countries are then forced to change over to the modern method of farming. It is not a natural method, and the farmers are soon deep in debt to the sellers of fertilizers and pesticides (the rich countries). Thus their new-found poverty is maintained. The only way they can break out of it, as you say, is to develop a manufacturing base. The citizens of these newly rich countries are then forced to to buy all their food from a central source, and are at last able to develop our western diseases, proving once and for all, that they have arrived at the pinnacle of economic success. For a competing explanation check out “The Mystery of Capital: Why Capitalism Triumphs in the West and Fails Everywhere Else” by Hernando De Soto. Stumbled across this post via a google search. Living in Australia, it’s hard to agree with the argument that countries that focus on primary industry stay poor. Australia is super rich off the back off primary exports, even with a high $.